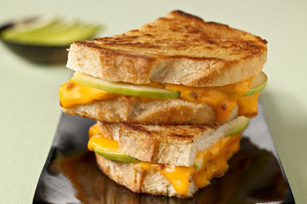 Give your grilled cheese sandwich a bistro-style upgrade with sourdough bread, bacon bits and apple slices. Top 1 bread slice with 1 VELVEETA Slice, bacon and apples; cover with remaining VELVEETA and bread slices. Cook in skillet on medium heat 3 min. on each side or until VELVEETA is melted and sandwich is golden brown on both sides. For extra flavor, spread bread slices with GREY POUPON Dijon Mustard before using to assemble sandwich. Omit bacon bits. Prepare sandwich using KRAFT Singles, substituting 2 tomato slices for the apple slices, and adding 2 slices cooked OSCAR MAYER Bacon to the sandwich filling. Substitute fresh pear slices or other fresh fruit slices for the apples.